The market for Victorian paintings and drawings has been on fire for the last several months, and the sale on Wednesday, comprising 108 lots, is expected to realize approximately £6 million. 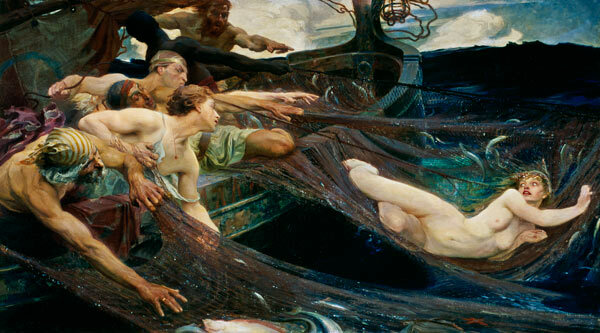 The star lots include, besides Alma Tadema's masterpiece, Chloe (1893) by Sir Edward John Poynter (estimate: £600,000-800,000) and The Sea Maiden (1894) by Herbert James Draper (estimate: £800,000-1,200,000). Works by John Ruskin, Frederic, Lord Leighton; Edward Burne-Jones; Edward Lear; George Frederic Watts; J. W. Waterhouse; John Lavery; John Everett Millais; and Laura Knight will also be sold. Sir Lawrence Alma Tadema (DNB bio here, Wiki bio here), one of the great exponents of High Victorian classicism, worked on Under the Roof of Blue Ionian Weather for more than two years as a commission for the financier Ernest Cassel. The title is adapted from Shelley’s "Letter to Maria Gisborne." The painting bathes the viewer in glorious sunshine, the generous sweep of marble benches with reclining sitters against an azure sea and sky suggesting infinite beauty and tranquility. It received extensive critical acclaim when it was first exhibited at the Royal Academy in 1901. Read the auction results press release here. I know Victorian classicism is over the top and somewhat passe now, but I would buy Sir Lawrence Alma Tadema's Under the Roof of Blue Ionian Weather in a heartbeat. 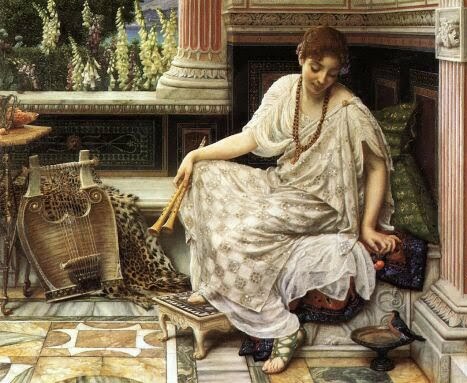 Or any Alma Tadema, for that matter. But "at least £1,000,000" is a bit out of my income bracket. Draper's Sea Maiden, on the other hand, is way too melodramatic for 21st century tastes. I'm with you, on both counts!